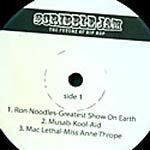 Never before on vinyl, the best tracks from the Scribble Jam Compilation #3 (released on CD in 2005). Plus a bonus track not on CD (Los Nativos-Ocecuatli). Limited to 1000 copies.